Celtic returned to the top of the Scottish Premier League with a comfortable win against Hibernian. Anthony Stokes fired the hosts into a fourth minute lead, then Gary Hooper converted from a penalty after Scott Brown was fouled by Hibs' Martin Scott. Hooper added his second of the night before the break, then a Liam Miller penalty gave Hibs a lifeline. Six minutes from time, Hooper sent a penalty wide after Freddie Ljungberg was brought down by Paul Hanlon. The victory puts Celtic two points ahead of Rangers at the top of the table, with both clubs having played the same number of matches. Celtic made three changes from the side who lost the Co-operative Insurance Cup final to Rangers with Stokes, Glenn Loovens and James Forrest all starting and Thomas Rogne, Georgios Samaras and Kris Commons all named on the bench. Hibs made four changes after their draw with Hearts at the weekend, as Michael Hart, David Stephens, David Wotherspoon and Ricardo Vaz Te were all added to the team for the visit to the east end of Glasgow. Hooper almost snatched the lead for Celtic inside the first minute, but struck straight at a fully-alert Mark Brown in the Hibernian goal. Two minutes later, Stokes made no mistake when Izaguirre threaded through a neat pass and the Irishman blasted the ball into the back of the net. Hooper grabbed Celtic's second from the spot after Scott was penalised for a clumsy challenge on Celtic captain Brown in the 20th minute. A Charlie Mulgrew free-kick almost handed Loovens his second goal of the season when the big Dutchman rose highest and nodded wide. The onslaught continued when Forrest fired in a right-footed shot from the edge of the Hibernian penalty area that warmed the hands of Brown. Hibs' first opportunity of the match arrived from a free-kick wide on the right that Miller sent straight into the arms of Celtic keeper Fraser Forster. Moments later, Vaz Te beat the offside trap to test Forster, who could only parry wide for a corner. The Hibs defence were left standing as half-time approached when Stokes delivered an inch-perfect ball through to Hooper and the Englishman struck with precision past Brown. On the stroke of half-time, Vaz Te headed a sterling opportunity wide of Forster's left-hand post. Shortly after the interval, Derek Riordan sprang into action and struck for goal from 18 yards out, Forster deflecting out for a corner - then the former Celtic man was substituted for Akpo Sodje due to injury. Brown had to look lively in the Hibs goal when Hooper bore down on him chasing a defence-splitting pass, then Izaguirre flashed a shot across the face of goal and inches past the right-hand post. Wotherspoon went down in the Celtic penalty area after a feeble challenge from Mulgrew in the 67th minute and referee Euan Norris pointed to the spot. Former Celtic midfielder Miller stepped up and coolly lobbed the ball past Forster to handed Hibs a lifeline. Stokes fired in a curling free-kick in the 72nd minute, but Hibs keeper Brown saw it coming a mile off and parried wide for a corner. A searching cross from Wotherspoon 10 minutes from the end could not find a Hibernian team-mate and the brief spell of pressure from the visitors soon fizzled out. In the final 10 minutes, Ljungberg came off the Celtic bench and earned the hosts another spot-kick after Hanlon needlessly brought the Swede down near the goal-line. However, Hooper passed up the chance to complete his hat-trick when he stepped up and sent the ball wide of Brown's left-hand post. 90:00+3:03 The final whistle goes and the game is over. 90:00+1:00 Outswinging corner taken by Fredrik Ljungberg from the right by-line played to the near post, clearance by Paul Hanlon. 86:26 The ball is swung over by Fredrik Ljungberg. 85:48 Victor Palsson fouled by Gary Hooper, the ref awards a free kick. Direct free kick taken by Michael Hart. 85:15 Corner taken by Liam Miller from the left by-line, Charlie Mulgrew makes a clearance. 83:42 Booking Paul Hanlon is shown a yellow card. 83:42 Penalty missed by Gary Hooper. 83:42 Unfair challenge on Fredrik Ljungberg by Paul Hanlon results in a Penalty. 83:18 Lewis Stevenson gives away a free kick for an unfair challenge on Kris Commons. Free kick taken by Kris Commons. 82:33 The ball is delivered by Mark Wilson, Close range shot by Kris Commons goes wide of the right-hand upright. 81:18 Free kick awarded for a foul by Lewis Stevenson on Mark Wilson. Direct free kick taken by Fraser Forster. 81:18 Substitution Beram Kayal leaves the field to be replaced by Fredrik Ljungberg. 80:20 Kris Commons delivers the ball, save by Mark Brown. 77:55 Substitution James Forrest goes off and Kris Commons comes on. 77:40 Headed effort from deep inside the penalty area by Gary Hooper goes harmlessly over the crossbar. 77:05 Foul by Callum Booth on Scott Brown, free kick awarded. Charlie Mulgrew takes the free kick. 74:31 Liam Miller has shot on goal from just outside the penalty box which goes wide of the right-hand upright. 74:11 Anthony Stokes is caught offside. Indirect free kick taken by Mark Brown. 71:58 David Wotherspoon challenges Joe Ledley unfairly and gives away a free kick. Direct free kick taken by Anthony Stokes. 71:58 Substitution Matt Thornhill replaces Ricardo Vaz Te. 71:58 Substitution Lewis Stevenson replaces Martin Scott. 68:50 The ball is crossed by Mark Wilson, Paul Hanlon manages to make a clearance. 67:04 Short corner worked by Liam Miller. 66:17 Foul by Charlie Mulgrew on David Wotherspoon, Penalty awarded. Assist by David Wotherspoon. 66:17 GOAL - Liam Miller:Celtic 3 - 1 Hibernian Liam Miller scores a penalty. Celtic 3-1 Hibernian. 65:18 Booking Charlie Mulgrew receives a caution. 61:28 Scott Brown has an effort at goal from just outside the area which goes wide of the left-hand post. 58:35 Foul by Martin Scott on Beram Kayal, free kick awarded. Thomas Rogne takes the free kick. 58:35 Booking Martin Scott receives a yellow card for unsporting behaviour. 55:40 Shot by Emilio Izaguirre from deep inside the penalty area misses to the right of the goal. 52:21 Anthony Stokes is caught offside. Free kick taken by Mark Brown. 50:58 Substitution Akpo Sodje on for Derek Riordan. 50:38 Derek Riordan takes a shot. Mark Wilson gets a block in. 50:26 Corner taken right-footed by Liam Miller from the left by-line, clearance by Charlie Mulgrew. 47:43 Outswinging corner taken by Charlie Mulgrew from the left by-line. 46:44 Mark Wilson delivers the ball, Paul Hanlon manages to make a clearance. 45:01 Substitution Thomas Rogne joins the action as a substitute, replacing Glenn Loovens. 45:00+1:24 The first half comes to an end. 44:51 Header from deep inside the area by Ricardo Vaz Te goes over the bar. 43:13 Victor Palsson gives away a free kick for an unfair challenge on Joe Ledley. Beram Kayal takes the free kick. 43:13 Booking Victor Palsson receives a yellow card for unsporting behaviour. 41:51 The assistant referee signals for offside against Gary Hooper. Free kick taken by Mark Brown. 40:02 Free kick awarded for an unfair challenge on Ricardo Vaz Te by Beram Kayal. Derek Riordan restarts play with the free kick. 38:27 Anthony Stokes provided the assist for the goal. 38:27 GOAL - Gary Hooper:Celtic 3 - 0 Hibernian Gary Hooper finds the net with a goal from inside the area to the top right corner of the goal. Celtic 3-0 Hibernian. 36:56 Derek Riordan is ruled offside. Indirect free kick taken by Mark Wilson. 35:37 The referee gives a free kick against Martin Scott for handball. Shot on goal comes in from Charlie Mulgrew from the free kick, Mark Brown makes a comfortable save. 35:16 Emilio Izaguirre sends in a cross, Callum Booth makes a clearance. 34:11 Derek Riordan is ruled offside. Glenn Loovens takes the indirect free kick. 32:45 Beram Kayal challenges Martin Scott unfairly and gives away a free kick. Liam Miller restarts play with the free kick. 31:06 Corner from the right by-line taken by Liam Miller, Glenn Loovens makes a clearance. 30:43 Corner taken by Liam Miller from the right by-line, Joe Ledley makes a clearance. 30:31 Ricardo Vaz Te takes a shot. Save made by Fraser Forster. 29:13 Liam Miller fouled by Mark Wilson, the ref awards a free kick. Free kick taken by Liam Miller. 29:13 Booking Mark Wilson receives a yellow card for unsporting behaviour. 27:53 Foul by Gary Hooper on Paul Hanlon, free kick awarded. Direct free kick taken by Paul Hanlon. 26:13 Effort from the edge of the area by Emilio Izaguirre goes wide of the right-hand upright. 25:25 Drilled right-footed shot by James Forrest. Mark Brown makes a save. 24:29 The ball is delivered by Anthony Stokes, David Stephens makes a clearance. 22:42 Michael Hart concedes a free kick for a foul on James Forrest. Charlie Mulgrew restarts play with the free kick. Headed effort from inside the box by Glenn Loovens misses to the right of the target. 20:40 The ball is sent over by Mark Wilson, clearance by David Stephens. 20:20 The ball is sent over by Emilio Izaguirre. 19:06 Scott Brown fouled by David Wotherspoon, the ref awards a Penalty. 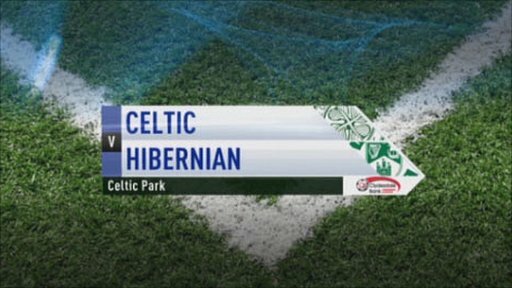 19:06 GOAL - Gary Hooper:Celtic 2 - 0 Hibernian Penalty scored by Gary Hooper. Celtic 2-0 Hibernian. 18:36 Assist on the goal came from Scott Brown. 17:35 Inswinging corner taken by Charlie Mulgrew from the left by-line played to the near post, Mark Wilson takes a shot. Clearance made by David Wotherspoon. 17:31 Emilio Izaguirre crosses the ball, clearance made by David Stephens. 16:35 Free kick awarded for a foul by Martin Scott on Beram Kayal. Free kick taken by Joe Ledley. 15:31 Scott Brown takes a shot. Paul Hanlon gets a block in. 15:22 Centre by Emilio Izaguirre, Paul Hanlon makes a clearance. 11:43 Unfair challenge on Victor Palsson by Beram Kayal results in a free kick. Paul Hanlon takes the free kick. 10:53 Ricardo Vaz Te challenges Charlie Mulgrew unfairly and gives away a free kick. Free kick taken by Mark Wilson. 8:59 Unfair challenge on Gary Hooper by Derek Riordan results in a free kick. Charlie Mulgrew takes the direct free kick. 8:44 The official flags Mark Wilson offside. Indirect free kick taken by Callum Booth. 8:11 Mark Wilson sends in a cross, Paul Hanlon makes a clearance. 7:29 Corner taken right-footed by Mark Wilson from the left by-line to the near post, David Wotherspoon makes a clearance. 7:23 A cross is delivered by Mark Wilson, Martin Scott gets a block in. 6:09 Header by Joe Ledley from deep inside the penalty area misses to the left of the goal. 4:19 James Forrest fouled by Michael Hart, the ref awards a free kick. Mark Wilson restarts play with the free kick. 3:13 Assist on the goal came from Emilio Izaguirre. 3:13 GOAL - Anthony Stokes:Celtic 1 - 0 Hibernian Anthony Stokes finds the net with a goal from inside the area to the bottom left corner of the goal. Celtic 1-0 Hibernian. 0:18 Gary Hooper takes a shot. Mark Brown makes a save.